HomeFAQTyre/Plastic Oil to Diesel Distillation PlantHow do you properly dispose of used motor oil? How do you properly dispose of used motor oil? Used motor oil retains a high energy potential. However, hazards and cost associated with collecting, storing, transporting, and general handling of used motor oil has limited the efforts to collect used motor oil for disposal or recycling. Although the prior art provides limited processing of used motor oil for other petroleum products, there remains a need for improvement within the art of converting used motor oil to a high quality energy source. 1. The used motor oil itself is collected and sent to the refinery for re-refining into non-standard diesel by the used motor oil refining machine. The main treatment of used motor oil is the base oil used to refine non-standard diesel oil. 2. The second treatment method for used motor oil is to burn and obtain energy. Large industrial boilers can burn waste oil efficiently and produce little pollution. Therefore, some of the used motor oil will be sent to the power plant or cement kiln to be used as fuel. On a smaller scale, some of the oil will be used by small companies for heating fuel. Convert used motor oil to diesel machine also can convert waste engine oil,wast lube oil to diesel fuel by distillation. 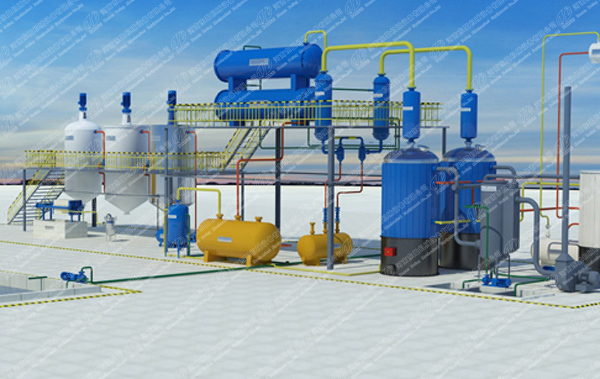 Convert used motor oil to diesel machine adopts the advanced distillation technology, which is used for refining tyre pyrolysis oil into qualified diesel fuel. And this kind of diesel oil can be directly used in low speed engines, such as digging machine, road roller, loading machine, etc. 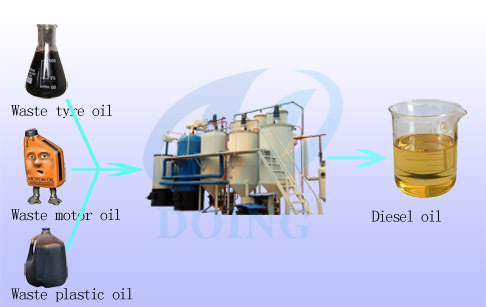 Convert used motor oil to diesel machine are equipped with totally sealed distillation reactor and distillation tower, auto feeding and discharging devices. And they are also equipped with latest air heating system, which can increase reactor's service life for extra 1-2 years. Therefore, Convert used motor oil to diesel machine has the features of safe, pollution-free and effective. 1. The reactor vertical design, automatic slagging. 2. The type of cooling is circulating water cooling, which can recycle water resources, with little consumption. 3. Semi-continuous equipment, the operation of relatively intermittent type equipment is simple, investment is moderate, only 2 workers are required to maintain the operation of the used motor oil to diesel machine. 4. Double heating system can save heating time and improve used motor oil to diesel machine efficiency. Choose our used motor oil to diesel machine ,We will provide you with professional engineer on-site installation instructions and equipment operation instructions. The used motor oil by our used motoe oil to diesel machine will not only be properly disposed of, but also the lucrative profit for you, the best choice for your investment! prev: How to change used oil to diesel fuel ? Next: How is plastic to diesel working process ?